The Deaths begins with the discovery of a series of murders by a coffee delivery boy. Yes, the characters The Deaths, by Mark Lawson, order coffee for their expensive espresso machines from a subscription-only coffee supplier, clamouring for ‘limited edition’ runs of ever more expensive bespoke blends. They’re those sorts of people. And really, that’s what this book is about: a certain type of person. Despite opening with a murder and spending the rest of the novel in flashback until the identities of the deceased and the motive for their murders are finally revealed, The Deaths isn’t really a mystery novel as such and the murder plot is simply a vehicle for a dark social satire. I’ve read reviews which have talked of The Deaths being a satire on the affluent middle-classes but – by my standards at least – these people strike me more as super-rich than simply affluent. The four couples around which the plot revolves, known as The Eight, own ponies, enormous detached sandstone houses with annexes for live-in nannies and own up to four cars apiece including a 'shopping Beetle'. All their many children are at private schools and only one of the women – Emily, a GP who also seems to be the only character who isn’t entirely repulsive – has a job. Oh, except for Tasha, who ostensibly runs a party catering business but whose clients seem only to consist of other members of The Eight. 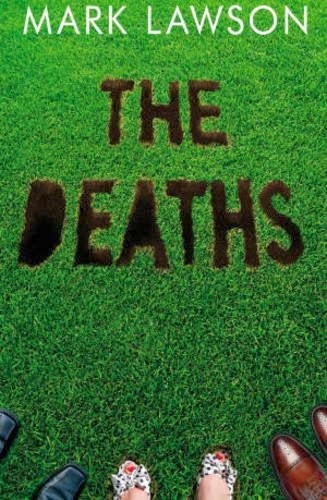 As you might have guessed, The Deaths is not a novel about people you’d want to spend an afternoon with unless you had money to burn and a lack of any social conscience. The Eight move in the circles of bankers, tycoons and QCs. They’re hideous snobs and thinly-veiled racists; they’re loud, socially competitive, superficial and spiteful, and Mark Lawson pulls no punches when it comes to lampooning them. The satire is exceptionally sharp and well-observed and often laugh-out-loud funny as Lawson picks apart the values and lifestyles of The Eight, allowing us to examine them in forensic detail. There are times when it begins to wear thin, though. For instance, it’s funny to learn for the first time that Jonny Crossan, a barrister whose father was a member of Thatcher’s cabinet, refers to a bowel movement as ‘a Smedgewick’, but less entertaining on the fifth or sixth mention. It’s also the case that when Lawson steps out of the adult characters’ viewpoints and writes as their teenage offspring, the characterisation is much less successful and cringingly far off the mark. The Deaths lacks subtlety of tone but is extremely readable and peppered throughout with neatly inserted hints, clues and red herrings that keep the reader guessing until the final outcome. I actually found that I frankly didn’t care which of the characters was dead on any emotional level, simply because they are to some degree interchangeable anyway, right down to their matching Australian au pairs, children with names like Henry and Josh and Plum, and their large-dog-small-dog combos (a dopey gundog and a scrappy terrier apiece) and I could feel almost no sympathy for anyone’s plight, such as it was. However, this certainly didn’t detract from my enjoyment of the book, which I found gleefully and grimly entertaining.